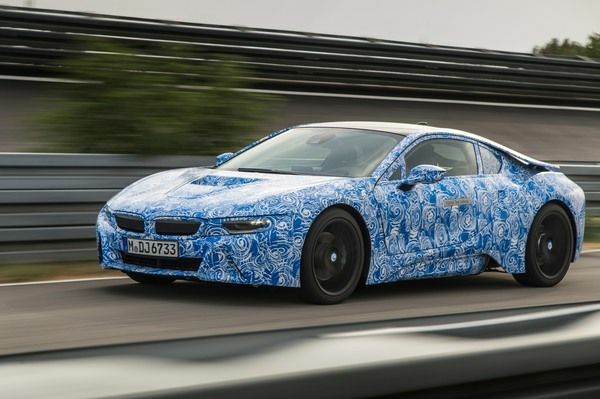 Following last weeks introduction of the BMW i3, that company's first all electric car, BMW unveiled today information on the long-awaited BMW i8, a plug-in hybrid sports car. BMW positions the i8 as a "revolutionary answer to the future challenges facing personal mobility to the sports car segment" and that it is the "most progressive sports car of our time". Big words, so lets see how the specifications line up. The BMW i8 is built on a similar architecture to the BMW i3. The vehicle is horizontally split into the Drive module, and the Life module. The Drive module is the chassis, is constructed of aluminum, and contains the drive train components, which we'll go over in a minute. The Life module is the passenger compartment, and is constructed by an ingenious new method of carbon fiber reinforced plastic (CFRP) manufacturing that allows for high volume low cost manufacturing. Between using aluminum for the chassis, and CFRP for the passenger compartment, the BMW i8 is very light weight contributing to higher efficiency. The Drive module of the i8 contains the battery pack, configured to run down a tunnel down the center of the car, a 231 hp (170 kW) gas engine in the rear to drive the rear wheels, and a 131 hp (96 kW) electric motor in the front to drive the front wheels. Electric driving range is approximately 22 miles (35 kilometers) and electric top speed is approximately 75 mph (120 km/h). With both drive systems engaged, the BMW i8 offers road-hugging all-wheel-drive performance with powerful acceleration and dynamic torque vectoring for excellent cornering ability. Fuel efficiency is expected to be 95 MPGe. The BMW TwinPower Turbo engine in the rear is BMW's first use of a new three cylinder internal combustion engine. The engine is equipped with latest-generation BMW TwinPower Turbo technology. The result is a compact unit with maximum power of 231 hp (170 kW) and the specific output of 154 hp (113 kW) per liter of displacement, which is similar to other high-performance sports car engines. Accelerator response is sharp and the three-cylinder unit quickly reaches its maximum torque of 236 lb-ft (320 Nm). Between the engine and the rear wheels is a six-speed automatic transmission. The electric motor, located in the front, is a hybrid synchronous electric motor specially developed and produced by the BMW Group for BMW i. It develops maximum power of 131 hp (96 kW), producing maximum torque of around 236 lb-ft (320 Nm) from standstill. Between the motor and the front wheels is a two-stage automatic transmission. The battery pack was developed and produced by BMW. It has a liquid cooling system and can be recharged through a normal J1772 charging socket. The car comes with a 120 volt line cord unit that provides a full recharge in about 3 1/2 hours, or at a normal J1772 level 2 charging station a full recharge is accomplished in about 1 1/2 hours. The battery pack can be recharged through regenerative braking, or through the generator/starter mounted to the gas engine. Combined maximum power and torque, between the gas engine and electric motor, of 362 hp (266 kW) and 420 lb-ft (570 Nm) meters provide dynamic and efficient all-wheel-drive performance. The intelligent powertrain control system coordinates power sources seamlessly with variable power-sharing between the internal combustion engine and the electric motor. With both power sources engaged, the 0 – 60 mph acceleration time is expected to be less than 4.5 seconds. Linear acceleration is maintained even at higher speeds by seamlessly shifting between the two power sources with no power flow interruptions when shifting gears. The electronically controlled top speed is 155 mph (250 km/h). The coordination of power between front and rear wheels makes for excitingly dynamic cornering. The power split is biased towards front or rear wheels changing dynamically throughout taking corners or driving in straight lines. The driver has unusual scope to adjust the drive and suspension settings of the vehicle in order to adapt the driving experience to his or her individual preferences. The Driving Experience Control switch on the center console offers a choice of two settings. The COMFORT mode is activated on starting the car, and offers a balance between sporty performance and fuel efficiency. The ECO PRO mode can be engaged supporting an efficiency-optimised driving style. That mode not only changes the algorithm for regenerative braking, it reprograms the air conditioning, seat heating and heated mirrors to operate at minimum power consumption. The BMW i8 will make its world debut at the Frankfurt Motor Show and arrive in BMW showrooms in 2014.